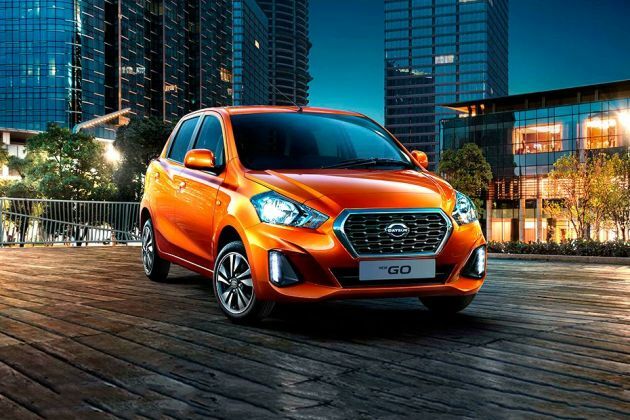 Datsun India, the fully owned subsidiary of Nissan Motors India Private Limited has officially launched the eagerly awaited hatchback, Datsun GO in the country. The car maker has introduced this model series in the entry level segment, wherein it will compete with the likes of Maruti Alto 800, Celerio, Chevrolet Spark, Hyundai Eon and other such small cars. It is available in a total of four trim levels wherein, the Datsun GO D is the base variant. The company has equipped this trim with a DOHC based 1.2-litre petrol power plant, which has 3-cylinders and can produce a decent mileage of 20.6 Kmpl (as per ARAI). This variant comes with numerous comfort and safety aspects unlike any other entry level hatchback. It features an engine immobilizer system, child safety locks and three point seat belts, which ensures optimum protection to all the occupants. At the same time, it comes with comfort features like rear bench folding seats, a heater, accessory socket, digital tachometer and a drive computer as well. What really is interesting about this hatchback is its distinct exterior that can grab your attention in the first impression. It also comes with a spacious interior cabin, which is equipped with numerous utility based features such as driver side storage tray, ticket holder, full molded door trim, collapsible AC vents with silver finish and an interior room lamp. This hatchback series comes with an unlimited warranty of two years given by the company, which is a very good proposition. The Datsun GO D is the base trim and it comes with standard exterior aspects. The front facade comes fitted with an aggressively designed headlight cluster, which is further equipped with halogen headlamps. It flanks a honeycomb grille, which has a thick silver surround. The front bumper comes in black color and it is integrated with a set of air ducts along with a wide air dam. The company logo is fitted in the center of this radiator grille, which gives an attractive look to the frontage. The side profile of this trim comes with basic features such as body colored door handles and driver side external wing mirror only. Here, the wheel arches have been fitted with regular 13-inch steel wheels , which are covered with wheel caps. These rims are further equipped with radial tyres, which have a robust grip on any road condition. Coming to the rear end, it has a distinctly crafted clear lens taillight cluster with reversing lights and side turn indicator. The boot lid has an expressive design and it is complimented by the company logo, which is fitted in the center. The rear bumper is black in color and it has space to affix the license plate as well. The cabin section of the Datsun GO D comes with ample space as it is built with a large wheelbase of 2450mm. The front cabin comes with connected seats that has spinal support and integrated headrests. These seats also have slide and reclining ability, which will improve the space and comfort for the occupants. At the rear, this trim is fitted with bench folding seats with integrated headrest, which will be useful in increasing the storage space. All the front and rear seats have been covered with good quality plain fabric upholstery. The dashboard comes equipped with collapsible air con vents that also have a silver finish along with an open glove box, an instrument cluster and a three spoke steering wheel as well. This hatchback is fitted with an advanced 1.2-litre, In-line petrol power plant that has a total displacement capacity of 1198cc . The company built this motor with 3 cylinders and 12 valves using the dual overhead camshaft valve configuration. It has the ability to produce a maximum power of 67Bhp at 5000rpm that results in generating a commanding torque output of 104Nm at 4000rpm. This engine is skillfully coupled with a 5-speed manual transmission gearbox, which allows the front wheels to draw the torque output. On the other hand, the manufacturer claims that the vehicle has the ability to return a maximum mileage of 20.6 Kmpl, which his rather good for this segment. This Datsun GO D is the base trim in the series and it comes with a robust suspension system. Its front axle is equipped with McPherson Strut type of a system along with double pivot lower arm , while the rear axle is assembled with an H-type torsion beam kind of a suspension accompanied with high performance linear dampers. As far as braking mechanism is concerned, its front wheels have been fitted with a pair of ventilated disc brakes and the rear ones come equipped with proficient drum brakes. Furthermore, the company has equipped this variant with an efficient steering system, which provides a good response at all times. This entry level trim is blessed with some of the basic convenience features, which includes collapsible air vents, spinal support front seats with integrated head rests, door arm rest, ergonomically located parking brake and gearshift lever. Other features of this trim includes a digital tachometer, rear bench seats that can be folded, a 12V accessory power socket, heater, remote fuel lid and a tailgate opener , follow me home headlamps, low fuel warning notification, trip meter, electronic fuel gauge and a digital tachometer as well. In addition to this, it also has a drive computer that has an instantaneous fuel economy indicator, average fuel economy and distance to empty feature as well. The company is offering this base variant with standard safety aspects that provides protection to the car and to the passengers as well. This variant is incorporated with an engine immobilizer system that prevents the engine from running unless the correct key is inserted. It also comes with three point seat belts for the front and rear seats along with two point rear center seat belt, child lock and a headlamp leveling device . 1. Mileage is competitive for this segment. 2. Very affordable price tag. 1. Basic looking exterior appearance. 2. No music system, air conditioner and power steering.